I know what you're thinking. Another Simpsons game, another crummy game trying to cash in on the show's popularity. Most of the time you'd be right, but in the case of The Simpsons Hit & Run you're way off mark. Just saying that it's the best Simpsons game ever wouldn't be saying much, but more surprising than Maggie shooting good ol' Monty is the fact that The Simpsons Hit & Run is a pretty enjoyable game in its own right. Homer has a few problems with Halloween traffic. The plotline has always been a weak point in Simpsons games, but the developers of Hit & Run decided to put an end to that tradition by hiring writers from the television show to write the game's storyline. The story in Hit & Run opens with Homer growing suspicious about the intentions of the black vans and flying wasp-mounted cameras appearing around Springfield. His investigation into the mysterious happenings in Springfield soon reveals that there is a bigger conspiracy afoot, and it will take the effort of all of the Simpsons (and Apu) to get to the bottom of things and save their city. Part of what makes the game fun is the fact that it is not entirely original, but borrows heavily from the top-selling PS2 game of all time. What you've got here is Grand Theft Auto 3 (GTA3) without the hookers and bloodshed. 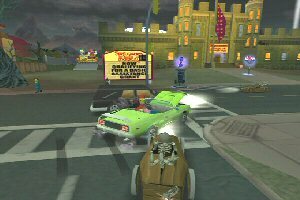 Instead of running around Liberty City, you get the chance to cruise the streets of Springfield, complete with traffic, wandering characters from the series, well-known locations such as Moe's Tavern, and enough references to Simpsons episodes to keep even the Comic Book Guy happy. The open-ended gameplay, hidden bonuses, and living city that made GTA3 such a hit serve to make Hit & Run fun to play as well. The game is played as a series of levels in which you control one of the Simpsons (with Apu subbing for Maggie). Each of these levels has a series of missions that must be completed to advance the storyline and eventually unlock the next level. In true GTA3 style, you can choose when you want to begin one of the level's story missions. When you're not completing a mission you are free to roam the streets of Springfield, which is a pleasure in and of itself as Hit & Run has created the best virtual version of Springfield ever to appear in a game. Each of the game's levels takes place in a different slice of Springfield - The Simpsons' neighborhood, downtown Springfield, etc. - and each level is packed with locations from the series and jam-packed with references to episodes of the show. Just exploring the expansive levels is a joy as there is plenty to see, both out in the open and hidden down back alleys, side streets, and even inside buildings. Most everything is accessible while driving, but to reach some hidden spots and secret areas you're just going to have to get out of your car and hoof it. You do want to see Apu's secret garden on the roof of the Kwik-E-Mart, don't you? Exploring the levels is not just a sightseeing venture, though. There are plenty of jumps and shortcuts that will save you valuable time during the missions once you discover them. Exploring is also the only way to discover the bonus missions and race challenges spread across each level. Completing the bonus missions and winning the race challenges will reward you with new vehicles to use in the game. There are usually seven story-based missions per level, and these are divided into a few phases each. The goals vary between missions and include simple sprints that require you to reach a certain point within a set time limit, chases, races, and scavenger hunts. The missions vary considerably in difficulty, with some requiring you to drive in top form and hit every shortcut available just to finish. Some missions are made even more difficult by forcing you to start a mission all over again when you fail. Since many missions consist of multiple tasks, it can be annoying to fall short on the final task and then be forced to replay the parts of the mission that you've already cleared. The game does try to mitigate this frustration by unlocking the next mission after you experience a number of unsuccessful attempts on a mission. You won't get credit for completing the failed mission, but at least you can move on with the game's story.